Our society has been facing an incredible shift concerning fitness and health. I am sure you noticed that it is now at the core of more and more discussions with your entourage. And when your friends start telling you how it was hard for them running 3 kilometers few months ago and that they are now running half-marathons every month, that’s when you start feeling shame about yourself. However, I think it is a useful shame that should be regarded as a first source of motivation. Besides, a little bit more exercise has never harmed anybody. I happened to get caught in this fitness-health cycle a while ago. Like most people, I wondered: « where and how do I start? ». Gym, at home, in a park, on my own, with friends, with a personal coach, …? While trying to find the perfect way to get in better shape, I found out what I simply wanted was flexibility. That is why I focused my attention on fitness-health related apps. Indeed, what easier way to exercise than by just getting your smartphone out of your pocket wherever and whenever you want and follow some app’s indications? After I tried many, this is my selection of the top 5 mobile apps of health and fitness of 2016. First things first. 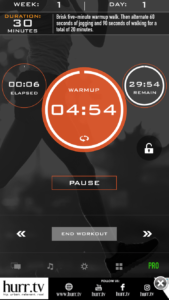 If you have never really ran before and that you lack motivation, it is the perfect mobile app for you! It brings you along an 8 weeks running program with detailed sessions and an audio coach. After this, you will be able to run your first 5K… and to keep going for more hopefully. Feel free to join their huge facebook and twitter community to read about people’s experiences and share yours. 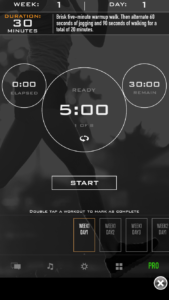 The app provides a huge number of exercises and workouts. It does not require equipment so you can literally start working out anywhere if you have some space. It is not time demanding, between 5 and 30 minutes per workout, so it will not impige on your other activities. Obviously, the app is more useful if you purchase the in-app virtual coach which costs around 30€/$ for 3 months. The coach enables you to access all exercises, to have custom trainings fitting your goals, your physical condition and the number of time you are available for workout per week. 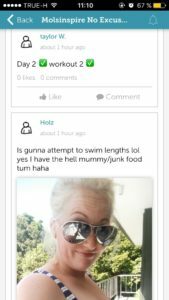 It also has a social feed where you can see pictures of friends and random people who are achieving or have achieved their body goals. This could help you keep your motivation up! 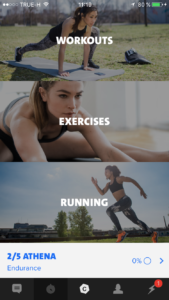 Other Freeletics apps exist: Freeletics Gym, Freeletics Running and Freeletics Nutrition. The latter is a way to keep a healthy diet. However, Freeletics Bodyweight is the real thing. 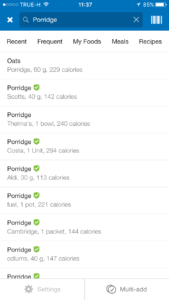 It is the perfect app if you have a weight goal, whereas it is to gain or to lose some. The app is very simple to use. Just enter your weight goal and it will tell you how much calories you must lose or gain per day. 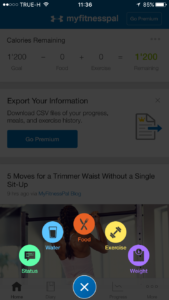 Each time you eat or exercise, upload it to the app. It has a huge database of products and exercises so you will see how much calories you still need to get for the current day. 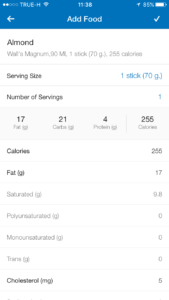 The mobile app features a barcode scanning tool that you can use to save time to add new food. If particular food or exercise don’t exist, no worry: it is possible to create your own that will be saved in your personal history. It also has a social feed where you can follow your friend’s progress. The really distinctive part is the follow-up to your diet. If you pay around 10€/$ per month or 50€/$, you will unlock all the follow-up and food advises features. 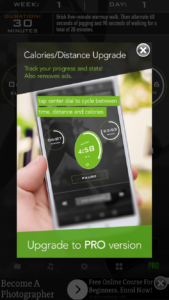 You can use it with other apps from Under Armour such as Endomondo to improve the results. 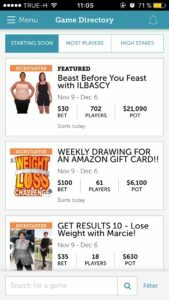 DietBet is the 2 in 1 sort of mobile app. 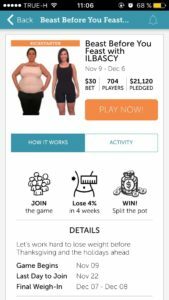 You lose weight and at the same time you earn money. How does it work? You join a bettor group by paying the admission price. You can choose it depending on how much you are ready to pay. After this, if you complete the 4% or 10% weight loss after respectively 4 weeks or 6 months, you share the pot with the winners. It is a perfect way to retrieve or keep up your motivation: people from each group share their experience and encourage each other. This mobile app requires that you have access to a treadmill but if you have, you should definitely download it! It combines running with visits of incredible places. 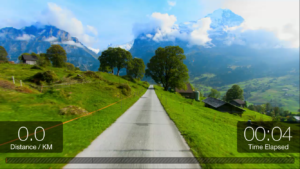 Put your smartphone or tablet in front of you, start the treadmill and here you go for a journey in the Swiss Alps, Tuscany, Death Valley and more. On your way, you will meet people who are running on the same journey so you will not feel lonely. You can also share these runs with friends: you will then see their avatars running next to you. Who thought it could be possible to feel in a new world while on a treadmill at home or in a gym? 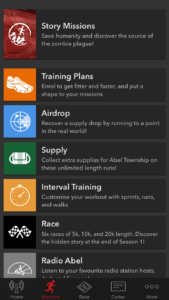 This is my crush mobile app, bringing a lot of fun to running. 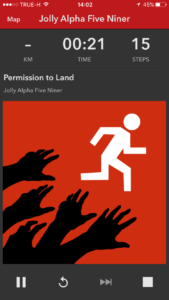 Its name is pretty explicit: it is about running away from zombies. A system of missions and audio stories will completely immerse you in this apocalyptical world. 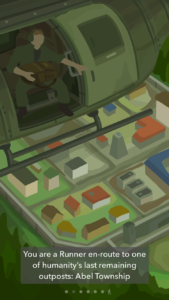 You will start running as often as you can to collect supplies for your in-app surviving community. It is also compatible with biking and walking. Now is the moment when you should start downloading an app and use it to achieve your body goal! Do you use one of these app or do you think one should, before all, be in this ranking? I would be grateful to get your opinion!